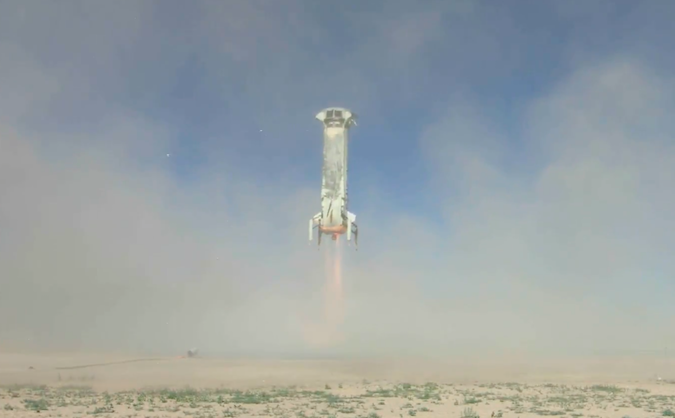 The stubby, single-stage New Shepard rocket took off from Bezos’ ranch north of Van Horn, Texas, at 11:36 a.m. EDT (1536 GMT) Wednesday, about a half-hour later then scheduled after engineers worked out unspecified issues in the final countdown. About 45 seconds later, at an altitude of around 16,000 feet (nearly 5,000 meters) and a velocity close to the speed of sound, a prototype crew capsule fastened to the top of the rocket fired a solid rocket motor to catapult free of the booster for a crucial in-flight test of the spacecraft’s emergency escape system, which would be triggered to whisk passengers away from an exploding launcher. No one was inside the capsule Wednesday, but the abort demo is a major milestone toward Blue Origin’s plans to begin flying test pilots on suborbital jaunts above 62 miles (100 kilometers) — the internationally-recognized boundary of space — as soon as next year. The four-ton capsule spun around and tumbled after the solid-fueled abort motor’s two-second firing, which propelled the vehicle several hundred away from the New Shepard rocket. Guided by reaction control system thrusters, the capsule’s motion stabilized as it deployed three drogue parachutes and three main chutes for a relatively gentle ride back to the ground, touching down at a speed of around 3 mph (5 kilometers per hour) about four minutes after liftoff. The headless booster continued upward after the capsule was severed, defying predictions that the intense aerodynamic loads and heat from the maneuver would be too much for the rocket’s control system to overcome. But the New Shepard’s BE-3 main engine, burning a combination of cryogenic liquid hydrogen and liquid oxygen, swiveled to deftly direct its thrust in response to the abort motor firing, keeping the rocket on course. The engine throttled down as programmed after the capsule jettisoned and burned for about three minutes to reach a point near the von Karman line, the edge of space, before falling back to Earth. 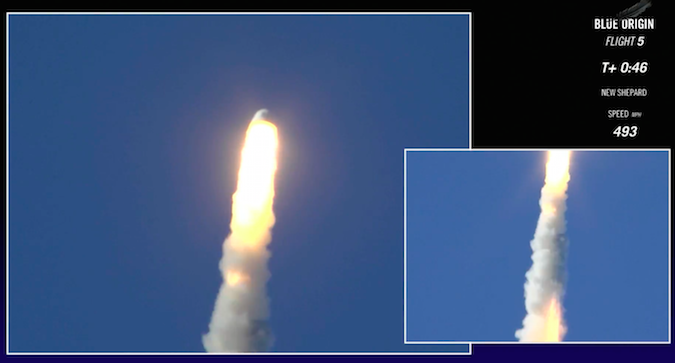 Commentators on Blue Origin’s live webcast did not say how high the booster flew. On the way back down, the rocket, named for Mercury astronaut Alan Shepard, extended a drag brake and wedge fins to slow its velocity, then ignited its BE-3 main engine again less than 30 seconds before landing. Four legs deployed from the base of the booster, and the engine steered the vehicle over Blue Origin’s landing site near New Shepard’s launch pad. The rocket landing occurred about seven-and-a-half minutes after launch. The launcher Blue Origin flew Wednesday has now flown five times, dating back to its maiden launch on Nov. 23, 2015, but this mission was its last. In an email update last month, Bezos wrote that the booster would probably not survive the test flight. The New Shepard’s abort system features a solid rocket motor mounted at the base of the crew capsule to push the spaceship away from the rocket to escape an emergency during launch. Most previous human-rated space capsules, including the Apollo and Soyuz spacecraft, have their abort motors on top of the rocket, where they would pull the capsule away to get out of the way if the rocket failed. But Blue Origin’s suborbital crew capsule, like commercial orbital-class spaceships being developed by SpaceX and Boeing, has a “pusher” escape system. The advantage is the escape motor does not have to be jettisoned and thrown away after every mission, as is the case with Soyuz flights. That makes the system more reliable by removing a potential failure mode, and less expensive because the abort motor can be reused until it is needed, then discarded. With a multimillion-dollar government funding arrangement with NASA, Blue Origin tested the escape system during a pad abort test in October 2012, demonstrating the motor’s ability to drive the capsule away from an explosion on the launch pad. NASA no longer provides monetary support to Blue Origin’s rocket development program, but the space agency still has “unfunded” agreements to offer engineering expertise. A successful escape test was expected to demonstrate the abort motor’s capability to save the passengers aboard the crew capsule even during the most stressing part of the flight. During operational crew-carrying flights, a signal from the booster’s computer, the capsule, or mission control could initiate the abort sequence. While the abort system’s design required the crew capsule to safely land, the New Shepard booster was never designed to survive such a maneuver, according to Blue Origin. 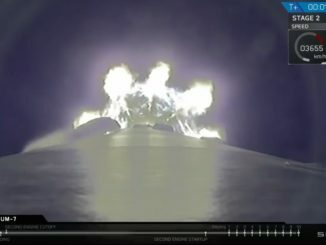 If the rocket ran into trouble after the abort command, its on-board computer would have ordered the BE-3 engine to shut down, and the booster would have plummeted back to the ground and exploded on impact. It turns out those computer simulations were right. Blue Origin officials said they plan to put the New Shepard booster and the crew capsule on public display. New Shepard was the first vehicle to fly to space and return to Earth with a vertical, rocket-assisted landing, logging that achievement on its first flight on Nov. 23, 2015. 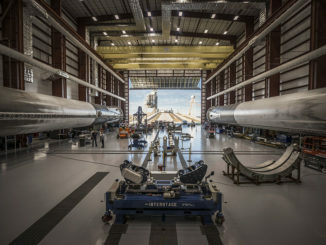 The successful recovery of the New Shepard last year came a month before SpaceX, a rival commercial space firm led by Elon Musk, landed a Falcon 9 first stage booster at Cape Canaveral after it sent 11 Orbcomm communications satellites toward orbit. The Falcon 9 is larger and reached higher speeds than New Shepard, but SpaceX has not yet re-flown a first stage booster. A commercial satellite operator, SES of Luxembourg, agreed in August to put a communications satellite on the first flight of a reused Falcon 9 rocket. The highly-anticipated launch of a “flight-proven” Falcon 9 booster was supposed to occur this month, but SpaceX’s rockets are grounded after an explosion on the launch pad in Florida on Sept. 1. SpaceX aims to resume launches as soon as mid-November, although the company’s investigation into last month’s rocket mishap is still ongoing, so the schedule could slip further. While the launcher flown Wednesday is 5-for-5, Blue Origin lost a previous New Shepard vehicle in April 2015. That rocket failed to land after an otherwise successful launch. A successful test Wednesday could pave the way for Blue Origin to begin flying test pilots on New Shepard launches next year, ahead of the start of commercial operations in 2018. Cornell said Blue Origin is working on the next iteration of its suborbital crew capsule, which could begin launching on a newly-built New Shepard rocket from West Texas in early 2017. It will be outfitted with windows and other accommodations for passengers. “We already have a couple of those capsules in process and almost complete, and those are the ones that are going to be flying next,” Cornell said. Blue Origin last month revealed the basic design of a larger orbital-class booster named New Glenn, after Mercury astronaut John Glenn, that could begin flying by the end of the decade. It will be propelled by a set of larger methane-burning BE-4 engines Blue Origin is currently testing on the ground. United Launch Alliance has also tapped Blue Origin’s BE-4 engine as the preferred powerplant for its next-generation Vulcan rocket, which will replace the company’s existing Atlas and Delta rocket fleet. Comments removed due to language.